Sandwiches are a staple in my home. And you know what is the death of a yummy sandwich? I knew they would prefer something softer and less hearty! One day, following experiment after experiment, a light went off in my head. I needed to soak all of my grains the night before — not just the sponge of the bread. This bread rises in less time so the taste isn't as sour. It does require preparation and must be babysat, but it's worth it. My son and I enjoy checking on the bread to see how high it has risen before popping it in the oven to bake. After struggling with dense, sour loaves of bread for years, one day a spark went off in my head. I needed to soak all of my grains the night before, not just the sponge of the bread. Thus a new softer, lighter sourdough bread was born! Makes 2 loaves. Mix the sponge ingredients together in a bowl. Loosely cover with a cloth to sit overnight. In a separate bowl, mix the soaked dough ingredients together, and also loosely cover to sit overnight. Add 2 eggs to the soaked dough mixture and incorporate well. Put both the soaked dough and sponge in a stand mixer of your choice (I use a Kitchen Aid) and mix for 2 to 3 minutes, until well incorporated. Let the dough sit in the mixer for around 30 minutes. Add the sea salt to the dough and mix for 3 to 4 minutes. Depending on the temperature, let dough rise for about an hour. Turn on mixer for 20 seconds. Let dough rise again for an hour, and then mix again for 20 seconds. After dough has risen for the second time, remove from mixer, knead on a floured surface, and separate the dough into two separate halves. Knead each half just enough to remove excess air, and form each half into a loaf to fit your bread pan. With a knife, slash the loaves of bread with a few marks down the center. Brush each loaf with butter or coconut oil. Cover both of the loaves and let rise in a warm spot. In the winter in our kitchen, this last rise takes a couple of hours. It may be only an hour in the summertime. Once the loaves have risen satisfactorily, preheat the oven to 350 degrees Fahrenheit. Bake loaves for 40 to 45 minutes until they sound hollow if you tap them. Remove bread from oven and cool out of pans. Lastly, don’t resist the urge to read a story with your little one while you both enjoy a buttery slice of warm bread — a favorite treat! 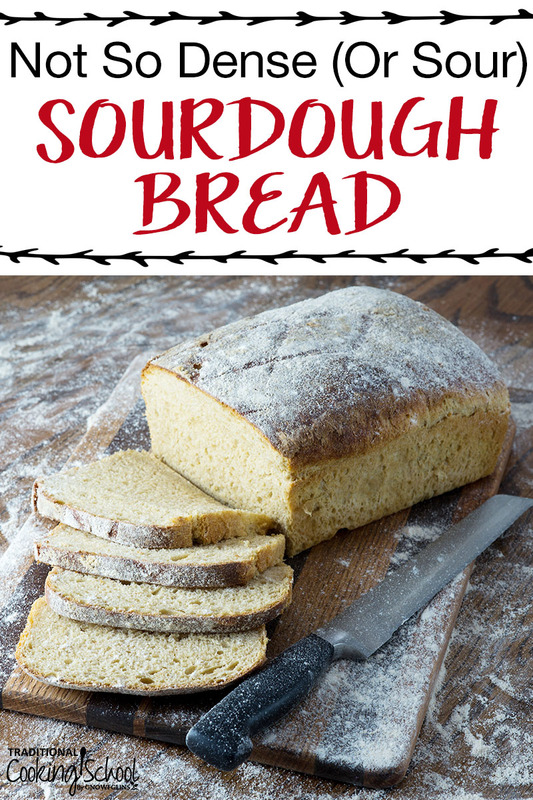 Does your sourdough bread ever turn out dense and sour? I hope this bread is just as delicious for you as it is for us! This post was featured in 26 Sourdough Bread Recipes. Tracey, thanks for posting. We actually don’t mind the sour taste, and since it’s supposed to help with gluten digestion, I might use your recipe, but with a few changes (letting all the flour sponge up overnight). I’ll try adding the extra honey, sugar, and egg though- that should make it rise more, and be lighter! Your loaves are beautiful. Mine do NOT look like that, haha. This has become my go – to bread. I make it every week for my family and it is consistently *perfect*! My husband even likes it for his sandwiches, which is huge! I use organic white flour for the hard wheat and I let it all sour in one bowl from the start. Thanks for the fabulous recipe! Hope it works for you, Mellissa! : ) I would love to hear the results. I make homemade bread all the time for sandwiches but never have I made a sourdough bread. I use this recipe when I make it though. I didnt’ know you had to soak it over night. Takes a little bit of planning ahead but well worth it I’m sure. This looks delish! Is it wheat/spelt flour you are soaking or the actual berries? Could you tell me what “hard wheat” is?? I am a rookie! Sue, there are some different varieties of hard wheat, which they say is better for bread making because of the higher gluten content. “Hard red winter wheat” or “hard white wheat” are 10-12% gluten, and “hard spring wheat” is even higher, at around 12-14%. So these flours make great breads. Soft wheat (red or white, but pretty much always winter wheat) is better for pastries and cake-making. Hope that helps! Great reply, Jennifer. : )))) I am sure that will help with your question, but please ask if there are additional questions, Sue. : ) I would love to hear how your loaves turn out and if you even try to cook them on your wood stove??? That would be an interesting adventure. Beautiful bread. So jealous. Must try. 🙂 Thanks for sharing. Happy New Year, Tracey, to you and your family. May it be a happy and healthy and prosperous one for you all. This looks to be a wonderful recipe. Thank you for sharing it! Happy New Year to you and your family as well! I hope the year is beginning well for you all by the grace of God. I can just see your lovely ladies in the kitchen making this- you all were such wonderful hosts and hostesses! Prayers from TN to OR! I NEVER had the thought to simply soak most of those ingredients I was adding the next day. I am so very happy and blessed by your excitement- thank you for writing! I do hope it works well for you! I would love to hear how it turns out! Happy bread making! I just finished making a half batch of your bread, Tracey, and it is delicious! (I halved the recipe only because I’ve wasted so many ingredients already making inedible sourdough. 🙂 I made the dough into sandwich rolls. They taste so good – not sour at all, and not crumbly at all either. I did add some yeast as “insurance” – refer back to the reason I halved the recipe – so I don’t know if that negates the benefits of souring/soaking – but the result is fantastic, very tasty, and will actually be eaten. 🙂 No matter how nutritious it might have been, my previous sourdough “bricks” didn’t contribute to anyone’s health when they went into the trash. Thanks so much for sharing your recipe!!!! I am so very happy and glad that you had good results! To be honest, I am not sure what effect the conventional yeast has, but ours rises well without it – as long as the starter is well fed and the dough is not left in an overly warm place. Hearing of your “bricks” reminds me of mine as well- the first time I made sourdough bread- I smiled with a cringe while I tried to eat it. We left for church and came home to find our dog had taken my loaf off the counter- but it was so terrible, even she did not eat it- that’s how bad it was! : )))) Hope this continues to work for you! God bless! We make sourdough bread every week at home and we’re completely hooked on it. However, variation is a must and you recipe will be a welcome addition to our collection. Hey there! I used einkorn flour and pastry flour (that’s all I had on hand) and I used my unfed starter because we like the sourness but this bread was amazing!!!!!!!! Totally worth the time, came out beautiful and just unbelievable!! I have not had luck in the bread department and my husband and I were kinda afraid lol. But it was soooo good! Thank you!!! So glad to hear, Alexis. I tried Emmer grain once, and I do not think there is as much gluten in it, so the rise was not as good. Glad to hear Einkorn worked!!!! Just out of curiosity, do you have an affordable source for Einkorn grain? I honestly used the Jovial brand of flour from our local Moms Organic grocery store. We don’t make bread too often because we’re trying to be mostly GAPS/ Paleo but good bread is our cheat every now and then. I will add that the bread was kind of “crumbly” when cut but it was delicious. Alexis, I’ve tried using einkorn flour (not the pastry type). I just can’t seem to get a good loaf from it. They are usually bricks. What recipe do you use? I really want it to work, because I feel that it’s better for you. But not if I have to throw it a way! Any way, just thought I’d ask. I do have a good active sourdough starter. I hope this recipe will work for you. : ) Based a comment I saw posted by Wardeh, as well as some reading, with the disclaimer that I by no means claim to be an expert- sourdough fermentation is best, then sprouting, then soaking- unless the soaking involves fermentation. When you say soaking flour versus whole grains, I am assuming that you mean sprouting the grains? If you are a member on GNOWFGLINS, check out the lessons in Fundamentals II page- this would be a great resource! I also make a dense sourdough bread. I will definitely be trying this recipe. Thank you for sharing it! I hope it turns out well for you, Tina!!!! I just finished making this today. It turned out really good! I followed the recipe exactly. I am wondering if you grind your wheat and spelt berries together or do you grind them separate every time? So glad to hear you liked the recipe! I usually grind my flours separately being that I have individual containers for red wheat and spelt, and then for my go to sprouted flours- soft white wheat, buckwheat, and spelt. My loaves are on the final rise and looking good. I had difficulty with too dry soaked dough ( I couldn’t possibly add all the flour called for), and then I had to add more flour after combining with the sponge, but still allowing for a sticky dough. I used fresh ground flours and wonder if I should have adjusted for this. Thank you! Thanks Tracey, I’ll keep this in mind on my next attempt. I am pleased with how this bread turned out! I am smiling that it turned out well!!!!!!!!!! I am trying this recipe… sort of. I am hoping the flour I am using is “hard” wheat. My question is this: When using my KitchenAid, should I be using the dough hook? That is what I guessed, but you didn’t say and this is not a standard dough. It just made sense not to use the paddle or the whisk. Is this what you used? What type of flour are you using? Basically any wheat (please someone correct me if I am wrong), is hard with the exception of soft white wheat or other soft varieties. However, I am saying this as someone who purchases all my grain and grinds it fresh, I am not sure about pre-grinded flours and all of the varieties. Hope the bread turned out well! How long should I knead the dough for? Mine’s on the second rise and pretty wet, compared to what I was used to in a bread machine. What I will say is there is a point in the machine “kneading” process that I notice the texture change from a bit sloppy and uneven to soft, but more together with smooth consistency- that is when I turn off the mixer (which is usually about 3-4 minutes of “kneading”). By hand, I would assume that to take at least 10-15. Sorry that I cannot offer more- if you do perfect the natural kneading, I would love to know the timing to be able to share with others. Yes, my next purchase is definitely a mixer that can handle freshly ground wheat – I’d like to nab one off craigslist, so I’m lurking there until a cheap KitchenAid or Bosch turns up. What do you use? I forged ahead before I heard from you, since it was time knead. I kneaded probably around 10 or so minutes, as you also said. I stopped when the texture went from gloppy and sticky to a little more doughy. I confess I had to flour my blob a good bit, because the cutting board and my fingers were getting all stuck to it. Although ultimately I ended up with some tasty bread, my loaves got very browned before they were done inside (I did go heavy on the melted butter). I covered with foil, baked longer, and finally got them to a ‘done enough’ point. I’m wondering if, with the Emmer I used in the sponge, I should use a little less liquid there. The soaker was pretty dense – spelt and hard red wheat. I think I’ll use something else to cut the red next time. I use a Kitchen aid and love it because it is so versatile- however, my mom gave it to me as a gift one year so I did not spend money on it. My grain mill is manual or has an attachment to the kitchen aid which is nice. I have been using it almost daily, with the exception of one or two days, for three years now and it still is going strong. I have friends who love the Bosch as well. I think you probably could not go wrong with either. : ) Happy lurking! 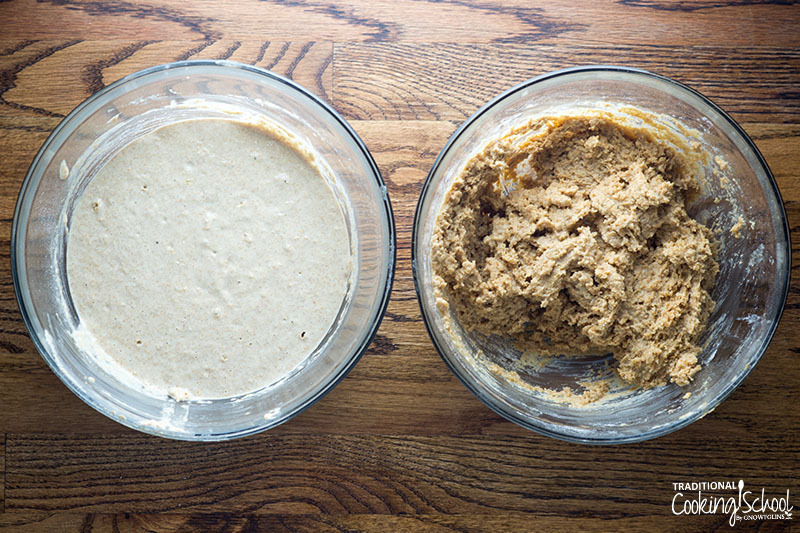 Did you try kneading with sprouted flour? This might be a good alternative. I have not had extreme success with Emmer- I think because of the lower gluten content. My lack of patience and desire to keep to our budget cause me to not experiment with it too much, though I would love to master this recipe with Emmer or Einkorn. I just thought I might mention something that I’ve found very helpful in my sourdough exploits- my old favorite recipe (that I no longer use because it required some conventional yeast) was very, very wet and sticky, but didn’t turn out well unless it was kneaded by hand for at least a part of the kneading process. I didn’t want to add extra flour at that point because it would not have time to soak, so my answer was to use extra olive oil. I oiled my counter and my hands well and was able to get even a super wet and sticky dough kneaded to satisfaction. Tracey- Thank you so much for this recipe! I have just converted to no longer using conventional yeast and our family likes but does not love the thick, dense result. I am excited to try this to see if I can get a better rise. I wonder, however, if you or anyone else has tried this recipe with only wheat flour instead of the spelt? What is the purpose of using half spelt flour? Thank you for the oil tip ! I value your comments and experiences very much!! 🙂 I’m so new to bread baking, that every little detail is going into my files! I’ve not yet sprouted and ground grains. I don’t have a lot of counter space to start with, but have heard sprouted grain bread is wonderful – maybe someday soon! Is your soaker not dense? Maybe I’ll put more of the liquid there & less in the sponge. Any ideas about the over-browning of the crust, top and sides? Organic Emmer is 25 lb – $43.75 through Azure, and if you have a local drop, only 8.5% is added for shipping. I think Emmer, Einkorn and Spelt act a lot differently than our higher chromosome modern hard wheat. Spelt is already at a high percentage in the recipe, so it may problematic to use Emmer and/or Einkorn as well. Thanks so much for all your advice! Have a wonderful day! Sprouted grains are wonderful and easy- and not much counter space at all! ; ) If you need help, GNOWFGLINS has so many resources or please feel free to ask! My soaker is not too dense- I have not tried it with emmer though which I think seems to absorb more and thus making it more dense. If it seems too dense, I would just add a bit of liquid to it. About the overbrowning- can you move your oven racks down so it is further away from the burner? Or maybe add butter/oil to the top during the last few minutes of bake. Thanks for the insight about emmer. I have purchased the emmer as well as einkhorn from Azure, but at the end of the month, with so many mouths to feed in our home, have not been able to make it work for us on a consistent basis. I hope to get there soon or try to cut back on grains to be able to use less and afford it. We’ll see. : )))) For now, I combine hard red and spelt which works well for us. It’s odd, but the loaves that over-browned were totally buttered and I had moved the oven racks down before baking. I’ll just keep trying! By the way, a friend tells me that Azure’s prices are lowest in the spring – for example, she is accustomed to buying organic durum for almost half the current price! I’m doing my first group buy this month, but I think I’ll hold off on the biggies for a couple of months. I know what you mean about the costs of some of the more rare grains. Our local Whole Foods has bulk, un-organic Farro (Emmer) – for $4 / lb.!!! Ouch! I sure would like to make a sourdough loaf that tasted more like store-bought, for the kids’ and hubbies’ sake. I need to buy a more ‘San Francisco-ish’ starter, I suppose. Thank you again for taking time to share your experiences and suggestions! Sprouting will be on my agenda soon! I would wait to butter until the last few minutes of cooking. I’ll keep an eye on Azure in Spring- I am so thankful for that company as they are my main source of supplies for our home. Thanks for the information. Do you have a WAPF local chapter? Many people here are willing to share their starters for free if you pick them up. I am stubborn and insisted on making my own starter. : ))) It is now a few years old and a special part of our kitchen. Hope your week has been well. Wow, Tracey! You’re cinnamon bread sounds ultra-yummy! I like the idea of mixing everything the night before, too. I’ll give it a try! I experimented with my own starter, but it didn’t have enough rising power. I used one that includes a bit of orange juice at the first stages. Sounded fool proof, and smelled right, but wasn’t active enough to make waffles or pancakes rise well, much less bread. I don’t give up easily, though, so I took it all in stride. The starter I have now (I think it’s from Bread for Life) can stay in the frig and only needs daily feeding – skipping a feeding is OK, too. I’m wondering now if the flours I feed it are causing the unusual flavor … maybe i should switch it to spelt only for feedings. Have a wonderful day and thank you again for all your help! In case you come back and read this, there is Hard White winter wheat and it has a milder taste than the hard Red winter wheat. After almost 5 years of searching for the right sourdough bread recipe this is the one! No more door stops! I’ve used the recipe twice and have wonderful, consistent results. Thank you! We used only the Spelt flour. We get it locally from Bob’s Red Mill across the river in Portland, Oregon. I called them last year to verify their source of grain and found that it is from farms in eastern Washington state. The loaves have turned out very nicely and are light and tasty. Thanks again, Tracy for the wonderful recipe! Thank you, Deanna! Enjoyed your blog post, too! I’ll give it a try with all spelt. I made this today in my cast iron loaf pans, and it turned out great! They looked exactly like yours. I had my doubts because my kitchen was so cold, and the dough wasn’t rising very well at all. I almost scratched it and made crackers out of it. I’m glad I didn’t! It rose a ton in the oven. Perfect sandwich bread! OK, so I have just finished incorporating the sponge with the soaked mixture and eggs and, phew! That was hard work. My Cuisinart mixer cannot handle all the dough. In fact, it can really only handle about 1/3 of it at a time, and it’s taking forever to get it all mixed together. The soaked mixture was very dense. I did not add any more liquid than the recipe called for, but the end result is a very sticky dough. I have followed the recipe exactly, but wish I had tried halving it first. I am using Prairie Gold Wheat and Bob’s Red Mill spelt flour– any ideas why this has been so difficult? Is this normal? Are other people’s mixers really able to handle all that dough? I will have to incorporate the salt by hand. Ultimately, the bread turned out great! Sorry that I did not get back to you earlier. I fear that I may not have been any help though. The dough fills my mixer (Kitchen-Aid) but not too much where is does not work. Yes, depending on the flour, the soaked part can be dense- if you think it is too much, add a bit a liquid. I am so glad this worked for you in the end!!!!! I hope if you try it again, it does not prove to be so difficult. May the Lord bless your weekend! I’m in the process of making this bread for the first time right now. I’m really excited to try it, since my family has been eating my sourdough brick loaves for the last 4 years now. 🙂 I’m using the dough hook on my kitchen aid. I’m wondering what kitchen aid speed you use to mix the dough (i.e. 2 or 4 or just ‘stir’). Thanks so much for the recipe! Hello Kalea, This is a bit late, but I usually start slow and then speed up to what my mixer can handle with the load of dough. In other words, I don’t really have a set speed- just eyeball it. : ) I hope the recipe turned out well for you! I made this bread, and it tasted good, but a little dense, and didn’t rise like the photos you included. I’d like to try mixing the sponge with the soaked, and let it rise overnight to see if it rises better. My question for you on the post about your cinnamon raisin bread is: did you incorporate egg, and let that rise all night as well? I’m not used to letting egg sit out for hours, but we’ve been buying free range eggs. It’s hard to let go of some of the things I’ve been taught about not letting food sit out! Sometimes depending on temps or lack of a good starter, it does not work well. A dense loaf has happened to me a couple of times. I hope it gets better as a dense loaf of bread is not so enjoyable. I mix my egg in and let it sit overnight, however, my chickens are right outside our window and we make our own soy free organic feed for them, so I know what they are eating and if they are healthy or not, thus I have no reservations. With that said though, if you do not feel comfortable, just forgo the egg and see what happens- my guess is, it just would not be so fluffy? Wish I had a better answer for you. Can you tell me if you tried Jennifer’s Cote’s adapted version (Jan 14, 2014), and if it turned out? I’m looking for simple as a busy mom, and one less bowl to wash makes a difference! I have tried it that way, and it tastes good, however seems to turn out a bit more dense and does not rise as well? That is my experience- however, when I am in a hurry- it is still better than store bought bread. ; )))) Hope that helps. I am trying this now, but soaking the sponge and soaker together because of time – I already will be kneading by hand, so I am hoping to save steps. Crossing fingers! If it isn’t awesome I will try again to a T.
Thank you so much for this recipe. My kids never enjoyed my sourdough bread and always asked for store bought, but now, they say it’s the best bread in the whole world!!! Thank you. I’m hooked! Yeah!!!!!! Thanks so much for sharing! God bless! PS I tremendously enjoy all your recipes; they are awesome. Hello, does the spelt flour play a major part in lightning up the bread? we live in guatemala, and we cannot find spelt or teff. We can find amaranth, rice, almond, soy, tapioca. What would be your recommendation, the flour that we tipically use is normal store bought whole wheat flour, which we know is not the best, but until we can get a sturdy grain mill that is the best we think we can do so far. Thank you. I wish I had a good recommendation. All I can say is maybe half the recipe and experiment- see what works for you and your family. You have encouraged me to experiment with other flours as well- I just ground up some oat flour. : )))) Let me know if you do try this with other grains/flours. So there is no yeast in this bread and rising is accomplished by the…eggs? I can’t get good rise in my whole wheat bread, though its 100% wheat (don’t have any spelt handy) and the constant rises/punch downs don’t work with instant yeast-only will rise once! Frustrating. And I am loathing this sourdough starter-dump out nearly all if its in fridge, then start again and wait 12 hours… I have actual children to educate and attend to! If the bread gets more attention than algebra, something isn’t right. The yeast is naturally occurring in the sourdough starter which is used in this recipe -it will cause a rise as long as it is a good starter. I can relate to not wanting to take a lot of time making bread, we home school and now have five little ones 8 and under, that is the main reason I love this recipe. Making sure I have a good starter going by evening time, before I go to bed, I soak everything for the bread which takes about 10 minutes. Then, in the morning while making breakfast, I let the kitchen aid knead it a few times before putting it in the pans to rise for the day. By afternoon/evening time, I have two fresh loaves of bread for the next day. Let me know if you have any questions as I am more than happy to help. Is there any possibility you could give the weights of the flour instead of the volume? I mill my own grain and let it fall right into my cup, but I think there is too much air in it, my dough became far too wet. It would be more accurate to know how many grams of flour (or grain berries) I need. I’m making my first bread with this recipe right now, and after the first rise I decided to add some more flour, but that’s not the perfect way of course. My daughter is allergic to wheat. She can eat spelt, thank goodness. Is there something I could mix with the spelt in this recipe besides a hard wheat that would help to lighten the loaf? I am also trying to find a recipe that is not so dense. I would love to get a rise like your picture. It looks so yummy! Thanks! Also, any official recipe using this mixture for cinnamon bread? Can you tell me the “feel” of the sponge mixture? I’d like to add honey instead of the sugar, and would want to decrease the liquid. Anyone tried honey instead of sugar? Also, any recipe using this mixture to make cinnamon bread? Hi! Ive been baking with sourdough for a while now and even though we love it I always wish my loaves would grow tall and be less dense. Just like the yours! I definetly want to try this one but wanted to know if it would work the same without the sugars. I dont mind the sour but I dont know if the sugar has other purposes. (i need to stay low carb because of blood sugar issues) Thanks for responding! Thank you for posting this recipe and taking the time to answer lots of questions. I was just wondering if this is a 100% wholemeal bread. I would really love to make bread the old fashioned bread, as God intended it to be! I have tried following this recipe http://www.his.com/~helend/SourDoughBread/FirstHighRise/ soaking wholemeal flour the night before, but it doesn’t say how much flour to add for the kneading… I’ve tried I don’t know how many times and it never really rises as much as I’d like it to, and it never rises in the oven. I am making bread today, this time adding 2/3 cup of wholemeal rye starter to the soaked wholemeal flour, because 2/3 cup should be the one part, if 2 cups is the three parts the Bible tells us about, if you see what I mean! Thank you for replying. My question was: do you use refined grains for this bread (or white flour, or grains without their external nutritious part, or whatever you call it!)? I’d like to make 100% wholemeal flour (wheat or spelt or whatever works!) bread, because I believe we were never meant to industrially refine flours, and I’ve read about how dangerous white flour can be for health. The trouble is that all the recipes I’ve used, apart from the one in the link and , mix white and brown flours. I manage to make good bread this way, but have failed up to now with only dark flours. I found the recipe above and it looks as if you have a lot of experience in baking with sourdough, hence my question! When you say “wholemeal” do you mean “whole grain?” When you describe “wholemeal” is sounds like you’re describing whole grain. I grind my own grains and use that flour to make this recipe. So I would consider that unrefined and “whole.” Hope this helps. Your comment sure helps! Thanks! I am going to make this! I have read the others post on their suggestions and attempts. I too think I will soak both batches and see how it turns out. Looking forward to making it. Thank you so much for this recipe! I have made it several times with amazing results every time. But I wasn’t making it as regularly as when I was making whole wheat bread in my bread maker. So I had the great idea to adapt it for the bread maker. I split the recipe exactly in half. I soaked the dough in my breadmaker pan and made the sponge in a separate bowl. The next morning I added the egg to the breadmaker and turned it on to the dough cycle. Then I added the sponge and mixed it using the dough cycle. Then the salt. I followed you’re time recommendations by manually turning off and on the breadmaker. I also ended up adding 1/4 flour to get the right consistently. Anyway, the bread turned out beautifully! Better than ever before and it was way less work and mess too! I hope this can help another busy mama like myself to make the healthiest bread possible in the least amount of time. Mackenzie, Thanks for posting this bread machine adaptation! It sounds like this bread doesn’t last long in your house, but I would appreciate a best guess from you or perhaps another commenter: what is the best way to store this (or any homemade) bread? I am very much a newbie at bread-making, so any advice would be welcome. Thanks! I just have one question so far. When I mixed up the sponge and the soaker and let them sit overnight covered with towels, the tops of both were quite dry this morning. It was more of an issue with the soaker because it was caked on top and lumpy. Maybe my house is dry? Should I consider covering with something more airtight next time or is this normal? Thanks! – If you’d prefer to soak through the day and assemble at night, I found (by mistake) that you could leave the formed loaves in their pans in the fridge overnight, covered, and take out a few hours before baking in the AM. Set in a warm place, such as on the top of the dehydrator. They do a slow rise in the fridge then taking it out a few hours before allows it to do the “final rise”. This bread takes a long time so time got away from me since I didn’t soak overnight. – I’ve found they work well in 1.5 pound loaf pans. I oil the pans with coconut oil or butter before puting the bread in. – Be sure to cover the bowls with plastic wrap. I’ve had too many soaked recipes become hard on the top by just covering with a towel. It doesn’t work. Plastic wrap is the way to go to seal in the moisture and prevent hardening on the top. I do the same for the mixing bowl with the combined doughs (sour and soaked). Each hour or so it sits I recover with plastic wrap. – My loaves took longer than 45 minutes. They were doughey in the middle. I’d say it took 1 hour at least. I also left them in the oven after I turned it off for about an hour just in case the middles weren’t done. Works like a gem. this is my first time making sourdough. my starter is finally ready 🙂 tell me what would be an apropriate time aprox for kneading? We are allergic to eggs. I also have been making the dense sourdough loaves and really want to use your recipe. Should I just leave the eggs out or use the commercial egg replacer (mostly arrowroot powder)? Tracey, I would just like to say that I have never made a better loaf of bread! I’ve just started baking without yeast, and am thoroughly satisfied with this recipe! I couldn’t believe how much it rose. Thank you for sharing this recipe! Such flavour! Such texture! MMMMMM. Any chance we could get a video of you making this recipe for the newbies to sourdough? My starter with the flour looks great, but the flour and milk sponge is dry. I added another 1/4 cup liquid, but it was still very hard to get the egg and the starter mixed in. It is now resting the 30 minutes in the machine. I’d love to be able to follow along with you as you make your loaves. I was excited to finally get my own starter going, and then went through two miserable failure recipes, until I found yours! Amazing! This is the nicest dough texture EVER! It was so stretchy that it got translucent. And delicious! Thank you for all your hard work at experimentation. The only thing I changed was to use all sprouted whole wheat flour. can i use glutenfree flour or mix GF with spelt flour? I don’t have any spelt, could I use just whole wheat flour? My whole wheat flour is soaked and sprouted, if that makes any difference in the outcome of fluffy vs. dense. Janelle, I used 100% sprouted whole wheat flour for this recipe, and have magnificent results. I, too, am interested in making this recipe without the spelt. What is SPROUTED whole wheat flour? I grind my own flour – I have hard red wheat and soft white. Any tips or suggestions would be much appreciated! I now make this bread with 100% hard wheat. It works great! 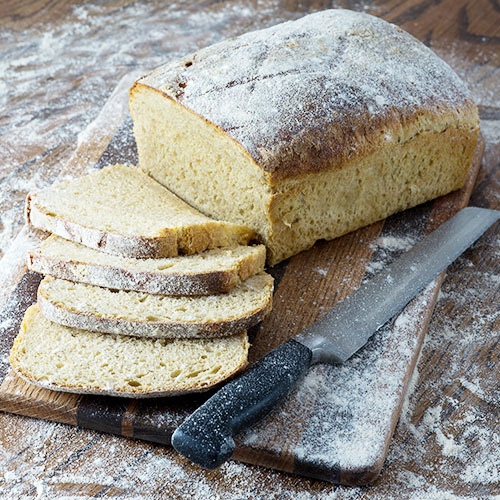 Don’t let the “dryness” of the soaked dough and/or sponge fool you – the end result will be a nice, tall, loaf that has beautiful texture and can be thinly sliced for sandwiches without falling apart. This is by far the best sourdough bread recipe I’ve found for home ground whole wheat. From the first time I tried it this has become THE best bread recipe ever. Sourdough that gets light, fluffy, and tastes delish! I’ve always just used all wheat flour (white whole wheat) but I want to transition to Einkorn now. Has anyone used this recipe with Einkorn? Please?